Samsung has made its name in mobile as the world’s biggest maker of Android devices. But it looks like it has different plans in mind when it comes to connected devices and the Internet of Things. Today, the company announced that it will be working with Microsoft to develop IoT devices based on Windows 10, where the companies will work together to develop products that will run on the platform, as well as integrate with other companies developing hardware and services on Microsoft’s OS. Samsung and Microsoft working together is not completely new: the two have already been working together for some 30 years on Windows devices, Myerson noted on stage today. But this latest development is new and underscores a couple of things. For one, Microsoft has not exactly been a winner in the last huge innovation in computing, smartphones: that honor has really gone to Google’s Android and Apple, who dominate the smartphone space in terms of device penetration, financials and mindshare. On the other hand, we’ve heard a lot about tensions between Samsung and Google over Android and perhaps this news is one way of Samsung indicating that it’s ready to dance with others if the occasion calls for it. The news of the IoT partnership made public at a keynote at the CES show in Las Vegas from Samsung’s president of its business solutions unit, WP Hong, who also outlined Samsung’s ambitions across all aspects of the IoT spectrum: as chip maker, device maker and service provider, part of the company’s “IoTivity” strategy. But not, it seems, as a platform maker. This is where Microsoft comes into play. “Platform is integral to Samsung’s IoT strategy,” said Terry Myerson, VP of Microsoft’s Windows devices. For now there doesn’t appear to be a lot of details of what shape this partnership will take but it looks like it will be part of what looks like a bigger relationship with the two and Microsoft’s own ambition to develop more universal windows apps that work across different devices and with a single unified security system in place across them. 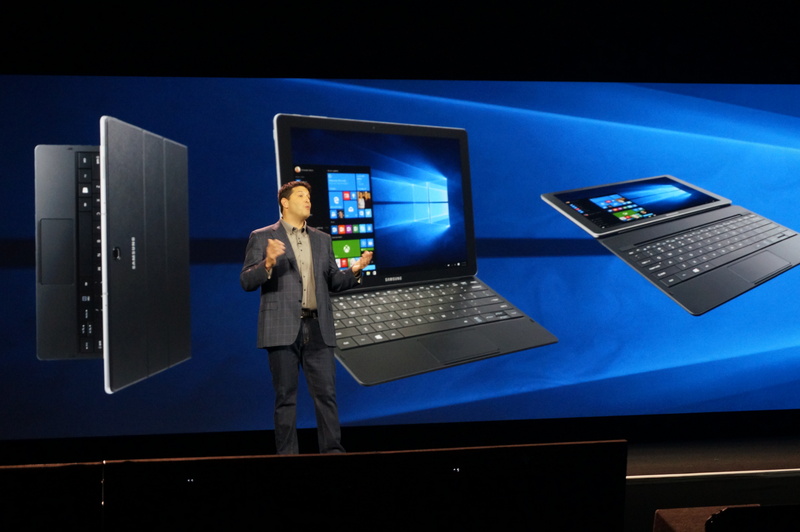 Myerson took the opportunity of being on stage to highlight a new Windows 10-based tablet, the Galaxy TabPro S, also announced here at CES, and drawing a link between it and the IoT news. “With Windows 10, both companies wanted to do something great together, and we showcased the new Samsung Galaxy TabPro S, along with our shared vision for future innovation together across the entire Internet of Things,” Myerson noted in a Microsoft blog post about the new IoT deal. Interestingly, though, Myerson did not use his stage time to talk about Windows 10 IoT Core, Microsoft’s slimmed-down version of Windows 10 specifically geared toward IoT devices. The reason for that could be that it is currently only available on non-Samsung devices like the Raspberry Pi 2, but today would’ve been a good day to talk a bit more about a joint effort involving Windows 10 IoT core. Instead, Myerson only talked about Windows 10 on the new TabPro S.
That leaves us with the question how deep this cooperation really is. If it’s only about using Windows 10 on some devices and occasionally integrating them with Cortana, it’s really not much of a partnership. We asked Microsoft for more details about the extent of this partnership and will update the post once we hear back. The IoT theme this morning follows on from yesterday’s keynote from IBM’s CEO Ginny Rometty, who also used her stage time to tout the company’s development of its Watson artificial intelligence platform. As part of that, she also highlighted how its data platform will rely heavily on the growth of IoT, both to gather data points and also to help control devices and services in the connected world.